The CAVE combines high-resolution, stereoscopic projection and 3-D computer graphics to create a complete sense of presence in a virtual environment, with projections covering three walls and the floor. "This has applications for faculty in computing, game design, psychology, the arts, and a wide range of other fields. People have a lot of ideas for how they could use it," Kurniawan said. Kurniawan's own projects include health-related games currently implemented on desktop or mobile devices, such as a game for improving maternity care that simulates a maternity ward. Transferring the games to the CAVE environment would be a big undertaking, but could have many advantages. "The CAVE can make the user experience much more realistic and immersive," she said. Wardrip-Fruin, who has used similar facilities at other institutions, said a CAVE can transport people into an alternate reality in a way that no other technology can do. "There is a big difference between experiencing virtual reality with a head-mounted display and experiencing it in a CAVE. It's a much more powerful experience of being present with the virtual world," he said. 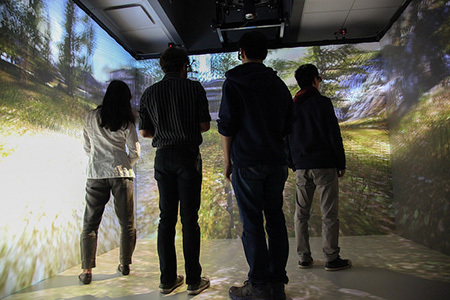 Arnav Jhala, an assistant professor of computational media whose research includes work on avatars with believable full-body interaction, said immersive visualization systems can significantly improve experiential learning in educational virtual environments. "Many educational environments, such as those for military or medical training, require players to be immersed in the surroundings of their target environment," Jhala said. "The CAVE Lab provides us with an environment for developing and evaluating these applications." The CAVE Lab features Mechdyne CAVE and FLEX technology and uses the Unity development platform for creating 3-D interactive environments. 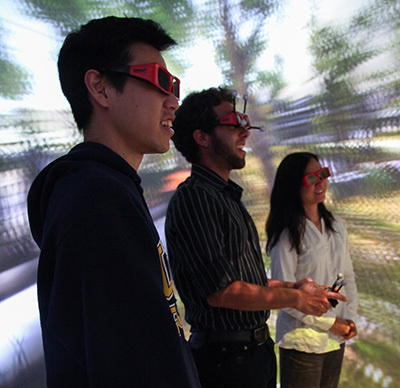 In addition to the $300,000 NSF grant, matching funds for the purchase of the CAVE, as well as room renovation and graduate student support costs, were provided by the UC Santa Cruz Office of Research, the Office of the Dean of the Baskin School of Engineering, and the Departments of Computer Engineering and Computer Science. These funds do not cover ongoing expenses and staffing of the facility, which will operate on a pay-for-use model.